best recipes that are Dad's favorites...or his soon-to-be favorites! Split bread horizontally into 3 equal slices. Place bottom layer of bread on a sheet of aluminum foil large enough to cover entire sandwich. Spread bottom layer with one tablespoon butter. Top with ham and half the cheese; drizzle with 2 tablespoons salad dressing. Place second layer of bread on top. Spread with remaining butter; top with turkey, salami, remaining cheese and remaining salad dressing. Place remaining layer of bread on top; brush with melted butter. Fold aluminum foil to completely wrap sandwich. Place on a baking sheet. Bake at 400 degrees for 15 minutes. Slice as desired. Makes 6 servings. Want to add this hop to your OWN blog? 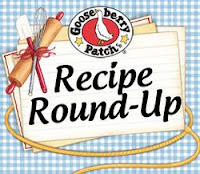 Go to Gooseberry Patch and get the link up code!